Greetings from Indiana, The Hoosier State. Postcard and Poster available at Legends’ General Store. One of eight states in the Great Lakes region, the state’s name means “Land of the Indians”. Known as the Hoosier State, the meaning of the term is debated, but has referenced those living there since the early 1820’s. It is the 38th largest state by area, and 17th most populous. It’s capital is the largest city, Indianapolis. It is one of 13 U.S. States divided into more than one time zone. Most of the state observes Eastern Time, however 12 counties currently observe Central Time. Although Indiana had not observed Daylight Savings Time in the past, starting in April of 2006 the entire state changes their clocks with DST. Visitors enjoy a range of scenes from quiet hills, to sand dunes, to the shores of Lake Michigan. More adventure can be found in the vibrant city of Indianapolis & its famous motor speedway; or touring numerous Amish communities, charming towns that border the Ohio River, or a trip to Brown County, dubbed ‘The Art Colony of the Midwest’. 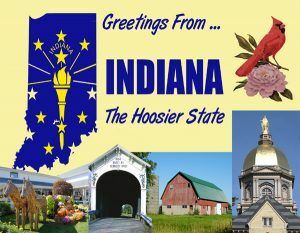 Indiana was admitted to the Union December 11, 1816. Flag of Indiana – A gold torch surrounded by an outer circle of thirteen stars, an inner semi circle of five stars, and a 19th, larger, star at the top of the torch, crowned by the word ‘Indiana’, representing Indiana’s admission to the Union as the 19th state. It was officially adopted May 31, 1917, and has remained unchanged. A previous ‘unofficial’ flag featured a buffalo and the state seal. 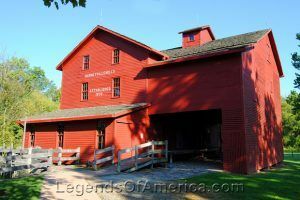 The Bonneyville Mill site dates back to 1832, but the actual Mill didn’t open until 1837 (despite the historic name and date painted on it). Click for prints, downloads and products. 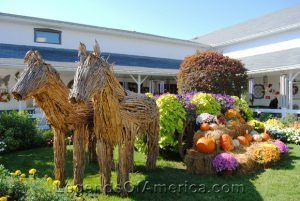 Shipshewana, IN – Autumn Display. Click for prints, downloads and products. 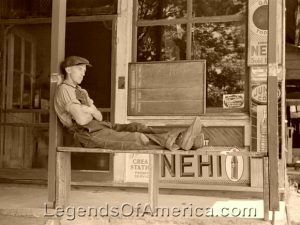 Resting in front of General Store, Blankenship, Indiana. Photo by Author Rothstein, 1939. Click for prints, downloads and products.